After taking a walk through the building, it was clear that many of the 25-year-old wooden-frame doors and windows were damaged due to time, use and weather. Sam Ervin pointed out – particularly without any furniture “hiding” parts of the building – that there were gaps between and under the doors. In addition, some of the window screens were warped and not hanging properly. In trying to open several of the windows and doors, it was clear that some did not open easily or at all; and if opened, were difficult, if not impossible, to close properly. Also, the double-pane windows in the kitchen and in one of the bedrooms had moisture permanently embedded between the panes. There was a hole in the bottom corner of the back door stuffed with a Brillo® pad. WHAT DID ALL THIS WEAR AND TEAR MEAN? The gaps also meant that during a rainstorm, wind from the west (a pre-dominant direction) drove water inside the building. Buzz and Ginger had to cover those windows with plastic tarps each time there was a heavy rainstorm. The closure and locking issues meant that there was not even the illusion of security. It seemed a determined tug could pull open many of the doors, even if locked. And, they were definitely not energy efficient. To address these problems, Sam and I researched window replacement options for months. We visited showrooms, talked to installers, and got bids. We explored different types of installation. And we considered several different configurations of window and door openings. In the end, Meher Mount finalized the plan and chose replacement products from the Madeira Series of Simonton Windows & Doors, Inc. for the retro-fit. The doors and windows are vinyl-framed and energy-efficient with tempered-glass. The team from West Coast Sash & Door, Inc. in Ventura, CA, arrived on Monday, July 9, 2018 and completed the installation of the first phase on July 11, 2018. The project was divided into two phases for cash flow considerations. The date for phase two — two windows and a single door on the east side of the building — is October 9, 2018. The practical considerations for replacing the existing 25-year-old doors and windows in the Visitor Center/Caretaker Quarters were numerous – better temperature control, keeping out pesky critters like mice and snakes, no water flooding in during the rainy season, and improved security. However, as the replacement doors and windows were being installed, the aesthetic reasons became obvious – more light, better views, and nicer looking doors and windows. This was a definite upgrade. With the new doors and windows — which have smaller frames and more open glass area than the previous doors and windows — the views are bigger and more visible. 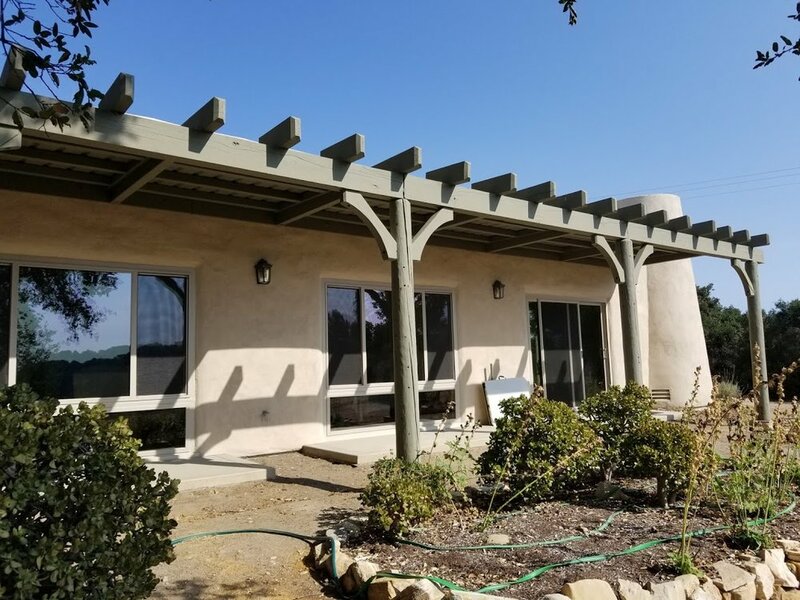 From the different viewpoints, you can see the Ojai Valley, the birds at the feeders, Baba’s Fireplace, and the Pacific Ocean. The new windows and doors have created a greater sense of openness to the outdoors. And with working screens, it’s delightful to open the doors and windows to let the gentle breezes flow through. Following a long tradition at Meher Mount which started during Meher Baba’s time and continued for many years while Agnes Baron was caretaker, Silence Day (July 10) is a work day. This tradition was particularly true for Silence Day 2018. The volunteers that day — Eric Turk, Ron Holsey, Sam Ervin, Cassandra Bramucci, and Margaret Magnus — were all silently working on various projects at Meher Mount throughout the day. The installers from West Coast Sash & Door were also putting in the replacement doors and windows. Earlier, we had explained to them that the Meher Mount team would be observing silence on July 10. Early that morning, I had a question for Armando Hernandez, the Operations Field Manager for West Coast Sash & Door. I wrote down my question for him to read. He started to respond by whispering, knowing that it was Silence Day. I immediately scribbled, “You can speak.” He answered the question in a normal voice, and we both smiled. Later that morning, two bicyclists rode into the driveway. Cassandra started to speak to them and then realized she was observing silence. We both looked at each other – neither of us having a notebook in hand at that moment. Then Armando came striding out of the Visitor Center to explain Silence Day to the bicyclists. He doubled checked with us to make sure that Meher Mount was open – which it was — and then explained they were welcome to look around, but not to ride their bikes on the trails. They nodded, smiled and rode off.